Arab musician and folk dancer Karim Nagi has been connecting worlds and audiences for 25 years. An Egyptian immigrant to the U.S., Nagi maintains a deep tradition and repertoire while developing relevant contemporary deliveries. He has lead the Sharq Arab Music Ensemble performing pan-Arab repertoire since 1999. He has organized and directed 14 Arab dance seminars. His Arabiqa program has performed educative assemblies in over 300 schools. He has recorded 14 CDs and 6 instructional DVDs, and performed on six continents. 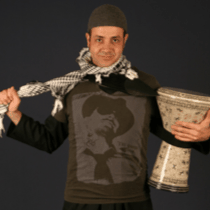 His current project “Detour Guide” is a one-man multimedia musical in English and Arabic taking audiences on an alternative tour of the Arab world and diaspora. All throughout, Nagi has kept his love and mastery of the riqq (Arab tambourine) prevalent, helping to raise its visibility as an instrument of virtuosity.